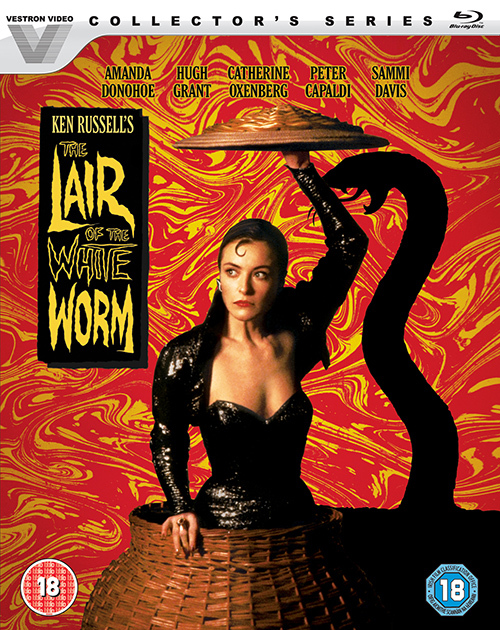 From Lionsgate UK comes The Lair of the White Worm, as part of their ongoing Vestron Collector’s Series, restored and remastered on Blu-ray. 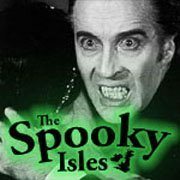 Scottish archaeologist Angus Flint (Peter Capaldi) unearths an unusual animal skull while digging in the garden of a Derbyshire B&B run by his girlfriend Mary (Sammi Davis) and her sister Eve (Catherine Oxenberg). Could it be linked to the local legend of a worm-like dragon (the Lambton Worm), which was said to have been slain by a distant relative of the current Lord of the Manor, James D’Ampton (Hugh Grant)? Could it have something to do with the disappearance of the girls parents many years beforehand? And why does the strangely alluring Lady (Amanda Donohoe) steal it? Mercurial director Ken Russell treads a fine line between titillation and terror in this, his wildly OTT tongue-in-cheek adaptation of Bram Stoker’s 1911 gothic novel. Amanda Donohoe camps it up big time as the very wicked Lady Silvia Marsh, a country-house aristocrat who enjoys worshipping a snake God and fanging the locals while wearing next to nothing. A shaggy-haired Peter Capaldi (who has since earned himself iconic status playing a certain Time Lord) gets an hilarious scene warding off a bloodsucking copper with a pair of bagpipes, while a fit looking Hugh Grant (fresh off the Edwardian gay love story Maurice) plays it typically posh and daft. Russell’s schoolboy humour might be a tad lame, but his shocking visual asides at Catholicism (nuns and dildos) are wonderfully irreverent, and the practical special effects are an inventive highlight. Donohoe’s tight-fitting costumes are also a seductive treat and the chilly location shoots that include the Peak District and Manifold Valley in Staffordshire are gorgeously lensed. Stoker purists, however, will probably be greatly offended. Lair of the White Worm copyright: Programme Content and Photography: © 1988 Vestron Pictures Inc. All Rights Reserved. Package Design: © 2018 Lionsgate Home Entertainment UK. All Rights Reserved. 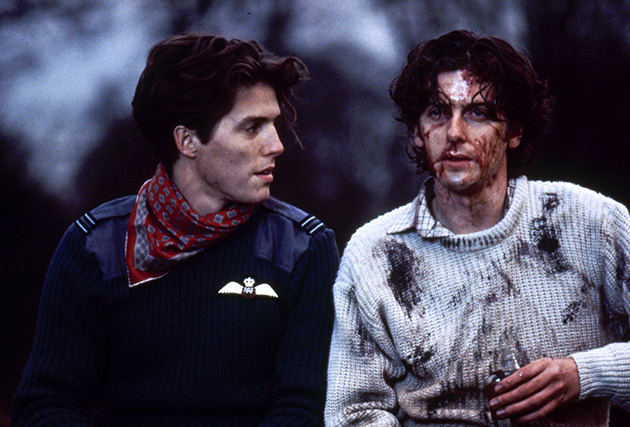 Posted on February 28, 2018, in Horror, Might-See and tagged Hugh Grant, Ken Russell, Lionsgate UK, Peter Capaldi, The Lair of the White Worm, Vestron Collectors Series. Bookmark the permalink. 2 Comments. I loved the soundtrack and Peter Capaldi dancing in a kilt!! Thank you for reminding me. Nice overview. I recently wrote an article about another one of Russel’s infamous films, The Devils. Truly a deranged genius in his time.